This is the last Sunday of Ordinary Time in our liturgical year. As we begin to prepare for Advent, the Church seeks to turn our thoughts to the return of the Master and the final judgement. Our first reading (Proverbs 31:10-13, 19-20, 30-31) is an excerpt from an alphabetical acrostic poem spoken by a queen mother to her son, King Lemuel. The longer version of the poem is an admonition of chastity, prudence and justice. Today's portion of the poem can be described as 'the virtuous woman' or the 'ideal wife'. her value is far beyond pearls. and works with loving hands. and her fingers ply the spindle. and extends her arms to the needy. the woman who fears the LORD is to be praised. and let her works praise her at the city gates. In our Epistle reading (1 Thessalonians 5:1-6), St. Paul reminds his readers that the day of the Lord will come like a thief in the night. He tells them (and us) not to live in fear but to live always prepared for the day the Lord will come. Concerning times and seasons, brothers and sisters, you have no need for anything to be written to you. For you yourselves know very well that the day of the Lord will come like a thief at night. When people are saying, "Peace and security, " then sudden disaster comes upon them, like labor pains upon a pregnant woman, and they will not escape. But you, brothers and sisters, are not in darkness, for that day to overtake you like a thief. For all of you are children of the light and children of the day. We are not of the night or of darkness. Therefore, let us not sleep as the rest do, but let us stay alert and sober. Our Gospel reading (Matthew 25:14-30) is a metaphor for the final judgement when the Master will return and call us to account for the gifts (talents) that he has given us. In today's parable, the master goes on a journey and gives three servants a number of talents (a sum of money). Two of the servants have put their talents to good use and are praised. The third buried his talents out of fear and is severely chastised. Jesus told his disciples this parable: "A man going on a journey called in his servants and entrusted his possessions to them. To one he gave five talents; to another, two; to a third, one - to each according to his ability. Then he went away. Immediately the one who received five talents went and traded with them, and made another five. Likewise, the one who received two made another two. But the man who received one went off and dug a hole in the ground and buried his master's money. After a long time the master of those servants came back and settled accounts with them. The one who had received five talents came forward bringing the additional five. He said, 'Master, you gave me five talents. See, I have made five more.' His master said to him, 'Well done, my good and faithful servant. Since you were faithful in small matters, I will give you great responsibilities. Come, share your master's joy.' Then the one who had received two talents also came forward and said, 'Master, you gave me two talents. See, I have made two more.' His master said to him, 'Well done, my good and faithful servant. Since you were faithful in small matters, I will give you great responsibilities. Come, share your master's joy.' 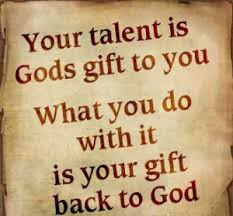 Then the one who had received the one talent came forward and said, 'Master, I knew you were a demanding person, harvesting where you did not plant and gathering where you did not scatter; so out of fear I went off and buried your talent in the ground. Here it is back.' His master said to him in reply, 'You wicked, lazy servant! So you knew that I harvest where I did not plant and gather where I did not scatter? Should you not then have put my money in the bank so that I could have got it back with interest on my return? Now then! Take the talent from him and give it to the one with ten. For to everyone who has, more will be given and he will grow rich; but from the one who has not, even what he has will be taken away. And throw this useless servant into the darkness outside, where there will be wailing and grinding of teeth.'" The day will surely come when we will all be called to account for how we have made use of our lives and the gifts God has given to us. Even though we know not the hour, we who live in the light have nothing to fear. "Therefore, let us not sleep as the rest do, but let us stay alert and sober." When our day of judgement comes, may the Lord say, "Well done, my good and faithful servant"; and like the virtuous woman in our first reading, may "her works praise her at the city gates."